How to get rid of ringworm? 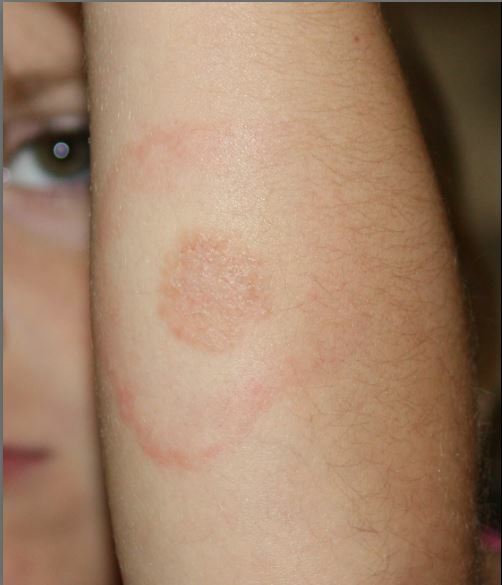 : Ringworm is a contagious skin infection caused by a fungus that goes by the name of Trichophyton rubrum. The fungus tends to thrive in warm, moist areas and can infect several areas of the skin, right from your scalp all the way down to your feet. Coined in accordance with the area that it affects, the syndrome is known as athlete’s foot if it appears on the feet, or jock itch if it appears on, well, the groin. Ringworm infections result in scaly round patches that are characterized by redness and itchiness, leading to a great deal of discomfort. Ringworm infections are contagious and rather difficult to eliminate, particularly when they surface on the scalp, toenails or fingernails. Having said that, the impulse to counter the infection with home remedies runs high which is why we’re bringing forth some ways in which you can counter the condition. Few pointers to keep in mind while treating the condition at home include keeping the area clean between treatments and ensuring that towels and sheets are washed regularly. Without further ado, we present to you 7 most effective home remedies to get rid of ringworm. Garlic makes it to the first of our list because of the effectiveness with which it can eradicate ringworm in their entirety. When ingested, garlic can treat multiple conditions including common cold, blood pressure, and cholesterol. It can be used topically as a natural remedy for ringworm as well. What makes it a standout is the presence of chemical compounds such as allicin and ajoene which boast of antibacterial and antifungal properties. Simply make a paste of fresh garlic cloves and apply it to the affected areas. Add in some olive oil if you would like to add some moisture to the paste. Apply the paste onto the affected areas and cover it with medical tape or an adhesive bandage. Leave it on for about an hour or so before washing away with warm water. Repeat this process twice or thrice a day for about two weeks. For anyone who is in need of a simple and effective method to treat ringworm at home, turmeric is all that you need. There’s more to turmeric than we give credit for, mainly its antibiotic properties. The best way to incorporate turmeric into your daily healing regime is to extract the fresh juice from the rhizome. Apply this onto the affected areas until the condition vanishes completely. Must read: How to get rid of keloids? The benefits imbibed within tea tree oil has been used in the treatment of skin related disorders for far too long now. From being the respite to acne and pimples need, to easing the impact of burns or cuts- this wonder oil has it all. With an introduction as impressive as this, it could only mean that the benefits extend to the treatment of ringworm as well. The antifungal and antiseptic agents present in tea tree oil can help fight off the fungus that causes ringworm. Dip a cotton ball in tea tree oil and allow it to soak. For sensitive skin, dilute the oil with an equivalent amount of water or lavender oil. Squeeze the oil onto the affected areas, ensuring that the ringworms are completely covered. Repeat this process three times every day to get rid of ringworm. If ever you find yourself in need of a home remedy to get rid of ringworm, do not hesitate to turn to aloe vera. Aloe vera has been used in the treatment of multiple skin conditions, so it’s no surprise that it claws its way up our list for ringworm too. Cut open a fresh aloe vera leaf so as to extract the gel. Apply the gel on the affected area and leave it on overnight. The following morning, wash it off with warm water. Follow this remedy up for as long as the ringworm ceases to surface. Any list involving home remedies would be incomplete without the omnipresent apple cider vinegar. When treating ringworms, salt makes the ideal companion to apple cider vinegar in drying up patches of ringworms that have been severed by excessive scratching. ACV creates an acidic environment that is difficult for the ringworm-causing fungus to thrive in, thus eliminates it for good. First of the top of our heads is a mixture of a teaspoon of salt in a tablespoon of apple cider vinegar. You can apply this paste directly on the ringworm affected areas and leave it on for about five minutes or so. Follow-up with this remedy twice or thrice a day for best results. Alternatively, to a basin filled with diluted apple cider vinegar, add a quarter of a cup of sea salt. Immerse the affected areas in this solution for anywhere between thirty minutes to an hour. Repeat this process twice every day. Also check: How to get rid of keratosis pilaris (chicken skin)? Anyone who’s in need of home remedies to get rid of ringworm can turn to mustard seeds for the perfect cure. Before you proceed to underestimate the power of these tiny seeds, consider this remedy. Soak mustard seeds in water for about thirty minutes. Grind the seeds so as to make a thick paste out of them. You know what the drill is by now, apply the paste onto the affected areas to seek relief from the itching and skin irritation. Also check: How to get rid of warts at home? Coconut oil can help you get rid of ringworm, thanks to its ability to eliminate the fungus that causes the infection. The antiviral and antibacterial properties work to dissolve the outer membranes of the microbes thereby killing them in the process. Take coconut oil and apply it to the area claimed captive by ringworm. Massage it on and leave it for a couple of minutes. Follow this process three or four times a day. Keep in mind that if you do not procure the desired results after a certain period of time, a visit to your doctor mandates. Surround yourself with a hygienic environment that revolves around a regular change in your bedding and inner wear. The key for a cure remains to lie in dry and tidy surroundings. We hope that our home remedies made their way to yours.